What if? 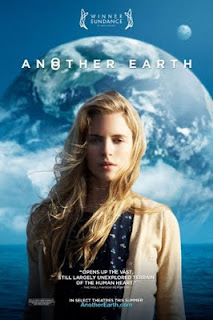 That's a question that haunts Rhoda (Brit Marling), a brilliant young astronomer, who makes a titanic mistake in the opening minutes of Another Earth. An imprecise reckoning of her own sobriety - as well as the distracting news on the radio that a new planet has been spotted in our solar system - leads to a devastating accident that kills the wife and young son of a Yale music professor (William Mapother), who is rendered comatose by the crash. After a stint in jail, Marling works up the nerve to ask a reawakened Mapother for forgiveness. But her composure quickly dissolves. Her exquisitely human gesture gives way to something easier and no less human: she lies, poses as a housecleaner, and bonds with her victim while the truth dangles precipitously over their doomed relationship. In the meantime, the mysterious planet has drawn ever closer to the Earth and it is surprisingly an exact copy of our Earth. It contains the same rivers, deserts, and cities, not to mention 7 billion or so dopplegangers. It's theorized that these mirror selves might provide insight on how our lives would have turned had we made different choices. Marling's curiosity level is high for obvious reasons. She enters an essay contest that awards the winner with a seat on a private spacecraft making the first journey to "Earth 2." Another Earth is science fiction without the science. More accurately, it's a scientific romance, much more H.G. Wells than Jules Verne. It ignores the technical details of how we avoided cataclysm despite the presence of an Earth-sized gravitational field on our front lawn. Instead, the film preoccupies itself with the effects of staggering scientific discoveries on individual lives, and how science can be therapeutic treatment for the inherent lack of order in messy human affairs. It's telling that Another Earth's scientific explanations are mostly channeled through talking heads on the TV or disembodied voices on the radio. The scientists' work is crucial to the future of humankind, but success requires a willingness to strip away emotion and subjectivity until their actions are charged with nothing but a cool rationality. That's just too much truth for any of the film's characters to endure. Mapother and Marling's relationship is unlikely, but not implausible. They find in each other a respite from the numbness that has plagued both of them since the accident. You can tell that she also enjoys his healthy skepticism towards the near-unanimous excitement surrounding the new planet. ("Do you think they call themselves 'Earth 2'?" he grumbles.) Less convincing are the film's subplots involving an elderly Indian co-worker of Marling's who exists to provide her with inscrutable advice about life, and odd sentiments straight from the tao of August Rush about how music is everywhere, man, and it makes us human. But these are minor missteps for the first narrative feature from two promising talents (writer-director Mike Cahill and co-writer/star Marling). Thoughtful and engaging, Another Earth sustains its inquisitive spirit right up until - and well after - the last frame. What if, indeed? Can't believe you didn't mention the nuanced, tender performance of Flava Flav. DJ FLAVA, YO! Get it right or taste the flava's wrath. Mapother's character was a bit spotty for me at points. Inconsistent in ways that couldn't be tossed off as post-traumatic stress but rather awkward writing/performing. And the non-science of this identical planet hurtling through space while maintaining it's earth-like climate really bothered me. I guess that's being a bit nitpicky/nerdy though. And my god is Brit Marling gorgeous. I found her to be especially magnetic, affecting.